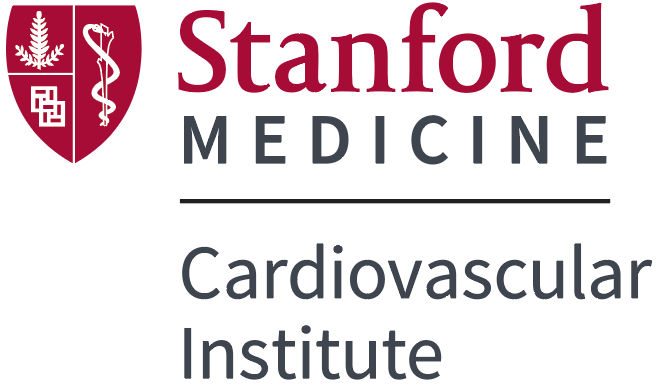 ComedyCures Founder, Saranne Rothberg, to present at the 2019 Stanford Drug Discovery Symposium. April 4, 2019, Project S.A.R.A.H. ComedyCures Foundation, Saranne Rothberg, Keynote Speaker at the Project S.A.R.A.H.’s 13th Annual Breakfast. ComedyCures is asponsor for the Comedy For Cargivers Healing Through Humor event at AATH on April 5, 2019. ComedyCures was the official charity! Laugh With Us December 10th at Our Comedy Fundraising Party! Click Here to Get Your Tickets, Sponsor, or For More Info. Mark Normand, Gina Brillon, Donnell Rawlings, Liz Miele, Quentin Heggs and Rick Younger, & Live Music by Bounce Entertainment. ComedyCures Will Bring Holiday Joy to Veterans! 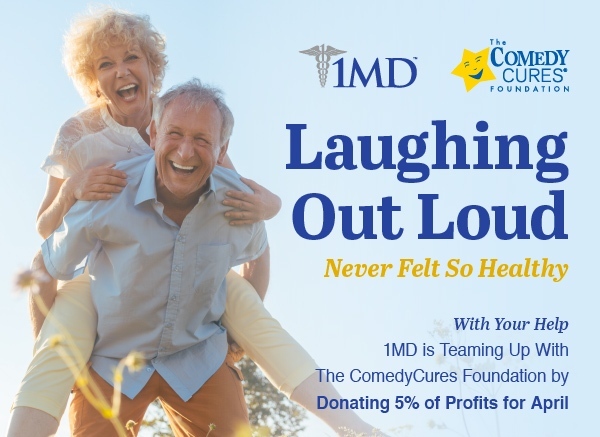 Our United States Veterans will team up with The ComedyCures Foundation, Comedian Marc Theobold, Founder, Saranne, and more for comedy fun and to learn some therapeutic humor strategies for everyday life. Our ComedyCures Founder, Saranne, Speaks at UC Berkeley & City of Hope! Research scientists, undergraduate and graduate students learn about the intersection of comedy, laughter, breast cancer. Check Out ComedyCures Humor Ambassador Delaney Roy! Yes, she is competing for “Miss Wolcott’s Outstanding Teen of The Year” and we are an integral part of her platform. Here she is getting jokes for the free ComedyCures LaughLine 1-888-Ha-Ha-Ha-Ha. Call it 24/7 and hear a joke #1 or #2 or leave a joke #3. Support Delaney and our patients. ComedyCures is an Official Charity of the 16th Annual LI Comedy Fest at The Theatre at Westbury. ComedyCures joins forces with Mamanet during October to increase breast cancer health among moms; focusing on fitness, comedy & health. ComedyCures is bringing joy, Russ Berrie stuffed animals, Tofutti Cuties, and our 24-hour free LaughLine 1-888-HA-HA-HA-HA to Camp Dream Street which serves children with cancer and other blood disorders and their siblings in a wide variety of social and recreational activities. 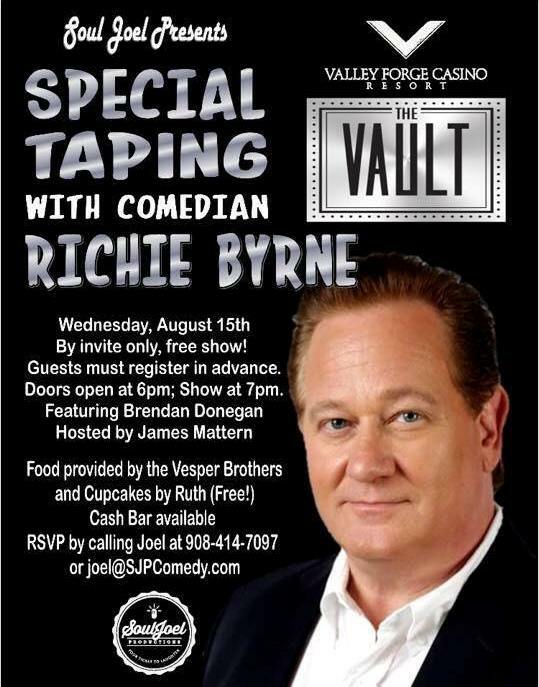 August 2018, ComedyCures Humor Ambassador, Richie Byrne, tapes his comedy special at The Valley Forge Casino & ComedyCures is the official charity! Thank you Richie! If you all want to come laugh with us for free on August 15th, let us know. We have a few VIP tickets. Thank you Log Jammers for your fun frisbee fundraiser supporting our free patient and caregiver programs! ComedyCures Comediennes, Sara Contreras and Founder Saranne Rothberg entertain homeless women at WIN in the NYC area. Just For Laughs names ComedyCures Founder, Saranne Rothberg, as a 2018 ComedyPro Power Broker. Congrats to ComedyCures Alum Becca Powell and Founder Saranne for winning Northeastern's Outstanding Campus Event Award for their February 2018 World Cancer Day Brunch Event. It was the first year and it sold out too. Congrats to all of the volunteers, sponsors and participants. ComedyCures participates in Providence Stain John's Heath Center's Cancer Survivor Day in Santa Monica, CA on Sunday, June 3, 2018. Thanks to ComedyCures Improv Artist Jorjeana Marie for her talent leading our workshop. ComedyCures performs at a NYC women's shelter in May. May 2018, NYC Movie Premiere Team of "Fame Us"
For every 1MD purchase made in the month of April, 1MD will donation 5% to ComedyCures. On Sunday April 29th from 10:00am-5:00pm ComedyCures will be participating in Girl Up NY at Stuyvesant High School in NYC. Passionate youth advocates ages 12-22 from around the New York Area will convene for the 1st annual Girl Up NY Leadership Summit in Manhattan, NY. This event will be one jam-packed day of leadership training, influential speakers, awesome panels, skills-based workshops, and mentorship opportunities. The Summit will include breakout sessions on advocacy, community, fundraising, leadership and education on the current status of girls in developing countries. Summit participants will gain core leadership skills, be trained in topics like community-building advocacy and fundraising, and experience interacting with motivated peers and successful women leaders. The Summit strives to empower, educate, and embolden the potential of every youth leader there. ComedyCures participated in the 2018 AATH Annual Conference "Resilience, Harnessing the Power of Humor" in San Diego, CA. ComedyCures Founder, Saranne Rothberg was the keynotes speaker at Northeastern's "World Cancer Day Bunch". ComedyCures partnered with NYU Medical Center for a unique, interactive evening. 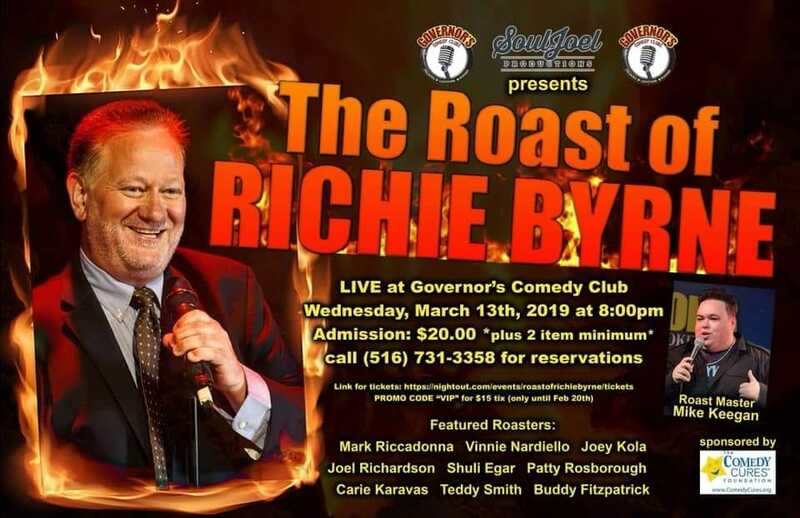 Laugh, develop your comic perspective, and build a community of support as Saranne Rothberg, Founder and CEO of the ComedyCures Foundation, and her special guest comedian Richie Byrne tickled funny bones and share fun daily strategies for living. This event was part of NYU Medical Center's Cancer Survivorship Learning Series. Registration: Register online, email cancerevents@nyumc.org, or call 212-263-2266. ComedyCures & Angels Envy and spread joy celebrated International Day of Happiness! 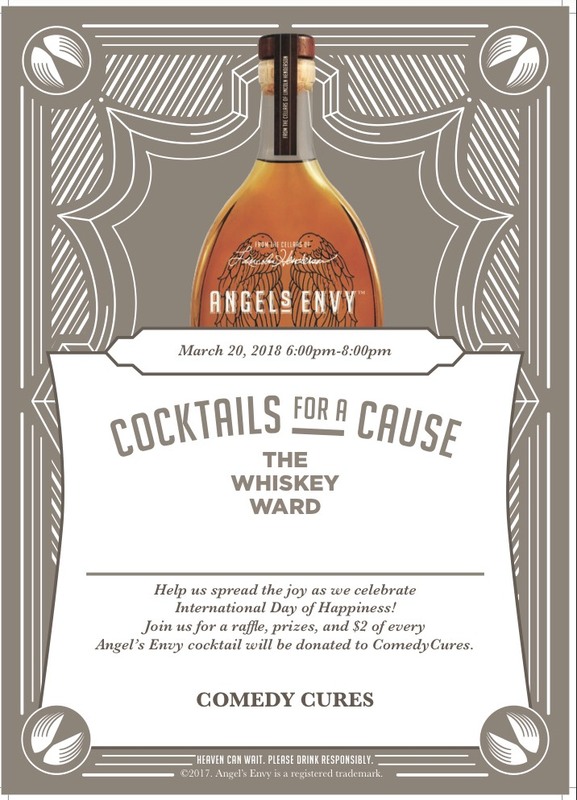 Raffle, prizes, and $2 of every Angel's Envy Cocktail will be donated to ComedyCures! NEWS FLASH! ComedyCures and Founder Saranne featured in CURE TODAY. 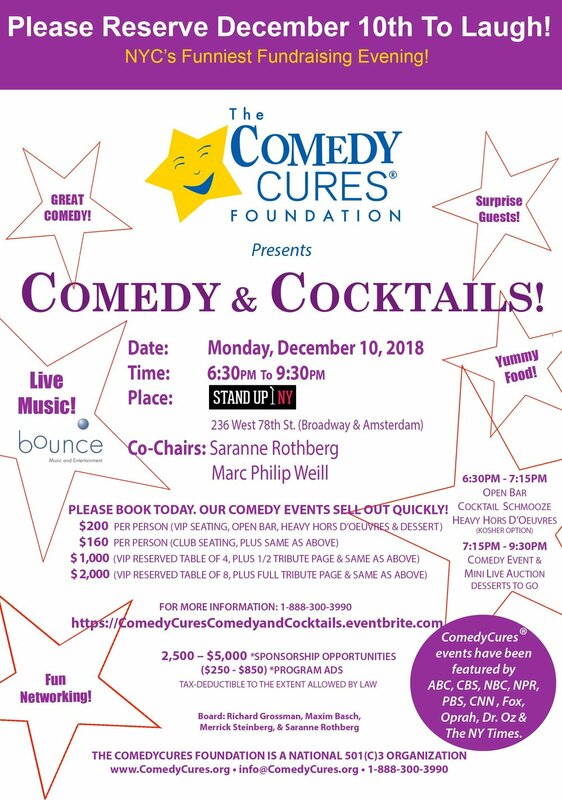 Funny Business in Cancer Care - "Cancer survivor Saranne Rothberg, CEO and co-founder of ComedyCures, has some suggestions. Rothberg, who has been in remission from stage 4 breast cancer for 18 years, credits her healing not only to her medical treatment but also to laughter." Dance & Laugh for Charity with Hila & Cat. 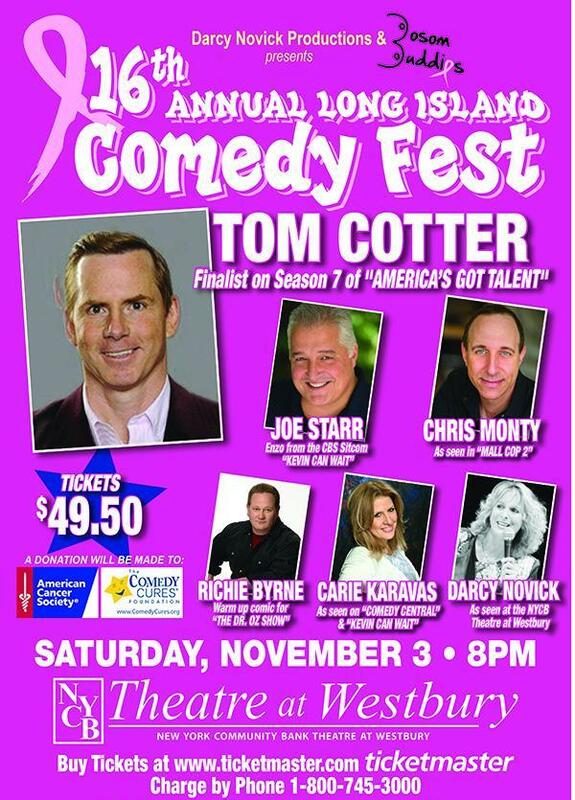 All proceeds support The ComedyCures Foundation FREE patient/caregiver programs. For more information about Zing Fitness click here. November 14, 2017, COMEDYCURES LAUGHINGLUNCH IN NYC! COMEDYCURES LAUGHINGLUNCH FALL 2017 BEGINS OUR 13th SEASON IN NYC! Thank you comedians Richie Byrne, Modi, Wil Sylvince, Saranne Rothberg and Matias Letelier, Stoddard Blackall & Vaughn Bergen for performing at our November 14th event. 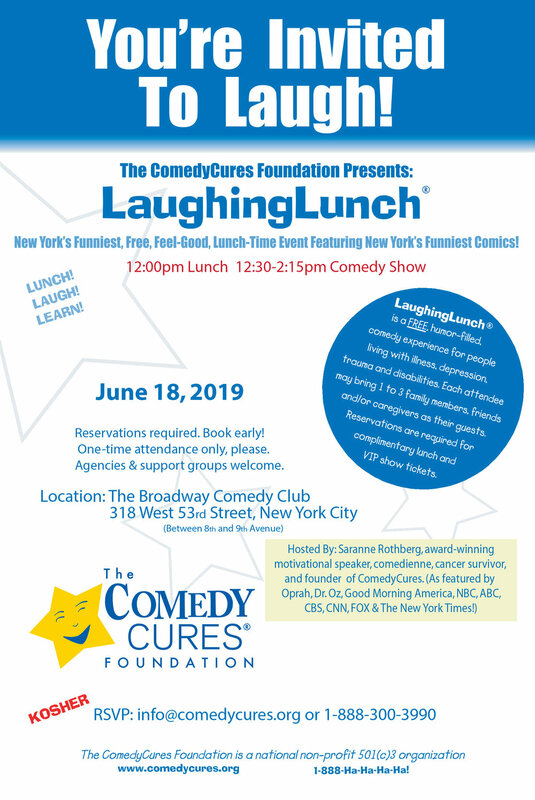 ComedyCures LaughingLunch® is a free, award-winning, therapeutic comedy program for people living with chronic and/or acute illness, depression, trauma and disabilities and their caregivers and family members. ComedyCures LaughingLunch® serves hundreds of hospitals and social service agencies with the help of the finest comedians and performers. ComedyCures LaughingLunch® videos can be watched via our video link or youtube/comedycures. ComedyCures Offcial Charity of the 15th Annual LI Comedy Fest at The Theatre at Westbury. Thank you comedians Chris Roach, Joe Starr, Richie Minervini, Carie Karavas, Jeff Norris & Darcy Novick. October 27, 2017, Comedy & Casino: for Laughter, Gaming, Dinner, Auction & More! Vegas Casino Night: HAWORTH COUNTRY CLUB designated ComedyCures.org as the 2017 charity recipient to support our award-winning patient and caregiver programs. THANK YOU! COMEDYCURES LAUGHINGLUNCH FALL 2017 BEGAN OUR 13th SEASON IN NYC! Check Out Our Relaunched LaughLine®. Thanks to Annuka & Rebecca! June 2017, ComedyCures will bring joy to a Hospital Cancer Survivor Celebration in NJ. June 2017, Diversity Engagement Specialist, Karith Foster will guest speak as Founder Saranne Rothberg hosts a major corporate thought-leader panel for an informative, interactive, and unique evening exploring the hottest issues in corporate culture. June 2017, Teens gather in DC area to raise money for ComedyCures.org patient and caregiver programs. Teen Tess M. decided to give back after her grandmother made a miraculous recovery after the family engaged in ComedyCures programs. May 2017, our Founder, Saranne Rothberg will be the Keynote Speaker for Lions in the DC area at unique Wellness Evening. April 2017, ComedyCures Make Me Laugh Event at Disney, as part of AATH. Our Founder, Saranne Rothberg guest hosted "The Conversation" live on MNN in NYC, (Time Warner Channel 56, Fios 34, RCN 83 and MNN Channel 2.) Her first guest was LeAnetta Future Robinson, a young Humanitarian, Singer, and Star of Bravo's newest series, "The First Family of Hip Hop". LeA is the granddaughter of Sylvia Robinson (of blessed memory). Sylvia was a Singer, Musician, Record Label Executive and the woman credited as being "The Mother of Hip-Hop". (We all still sing Rapper's Delight by Sugarhill Gang and many more rap hits!) LeAnetta also has volunteered at ComedyCures for years. OPRAH NAMES SARANNE HER "HERO" IN HER NY TIMES BEST SELLING BOOK. Saranne's story was also the most responded to story in the most read issue of "O" Magazine at the time of publication. This massive response propelled Saranne into "Live Your Best Life", Oprah's best selling book. To read the article, please click here. You can learn more about our 18-year history, and our Founders Saranne Rothberg and Lauriel Marger, and our hundreds of comedians by clicking on “Our Story” or “Watch Our Videos” or "Our Team". Please join us on our social media sites and sign up for our newsletter for updates. Thanks! If you would like to collaborate, sponsor, book a program or a performer please contact us.